Voice of the Magi, The. Official Organ of the Ancient Order of Melchisedek, A Journal of Occult Science, Spiritualism and Reform / A Monthly Magazine of Occult Science, Philosophy and Religion / A journal of Religion, Philosophy and Occult Science /A Monthly Magazine of Occult Science, Philosophy and Religion. Kansas City, MO, then Waldron, AR. Publisher: E.H. Adams; Magi Publishing Co. Editor: S. Magee; Rev. Edward H. Adams; Mrs. L.S. Huck, associate editor. 1/1, October 1902-1918(?) 32 -40 pp., 50 cents-$1.00 a year. The volume numbering (November 1908 was whole number 62) indicates the start date given, but Sunflower, March 1901, prints an excerpt from the journal so there may have been a hiatus in publication. This was the organ of the Ancient Order of Melchisedek and its adjunct Fraternity of Jesus, which were the creation of the "clairvoyant, seer and psychometer," Prof./Rev. Edward H. Adams, who started the movement in Kansas City, Missouri, before moving to Waldron, Arkansas. Adams claimed to be an "adept of both Oriental and Occidental occultism," having devoted 30 years to master the field, but first came to public notice as the co-editor of G.H. Walser's Orthopaedian (1898-1900), a short-lived materialist-spiritualist-reform production, and with Walser and others published The Orthopaedian New Testament (1900) which corrected and supplemented the Gospels with Adams' trance communications from Jesus Christ, John the Baptist, and others. The next year, in Kansas City, Adams started the Order and the journal. "It was founded to teach and conserve the secret doctrines. It was in the great temple in Egypt, that the Master, Jesus of Nazareth, was initiated into the secret doctrine, and from whence he came up into Galilee, where he practiced its teachings, taught and organized temples. The Order became so corrupted in the third century, A. D., that it was disbanded. But as its teachings were revealed to Melchisedek by discarnate spirits, so has this order, its ritualistic work, and its teachings, been again revealed through a seer whom they chose and prepared for that purpose, (who is a deep trance medium), and it has been taken down by competent scribes, in the presence of witnesses." The Order claimed to "lead its members into the college of fine forces," teaching "how to develop his, or her psychic powers, and become clairvoyant, to see; clairaudient, to hear; and psychometric, to sense and know. It teaches the laws governing trance and inspirational mediumship. It teaches how to develop the power to heal," etc. More practically, the journal noted, "the fees are low considering the vast amount of instruction given its members." Twelve degrees were offered. The first five dealt with "clairvoyancy," psychometry and healing; the sixth taught the powers of the spirit, both carnate and discarnate; the seventh and eighth, the laws of man's physical being as it evolves from the "cosmic mist"; the ninth and tenth, the "alchemies of nature"; the eleventh taught Inspiration and Revelation, "the Ancient Mystery"; and the twelfth offered "the key to that hieroglyph, the Bible." Adams published at least some of the degree work: Brotherhood of Jesus, Ancient Order of Melchisedek; Three Lessons of the 7th and 8th Degrees and Secret Teaching; The Ten Lessons of the Tenth Degree of the Brotherhood of Jesus (1908). Each degree came with lessons and fees: the first five for $5.00, and $25.00 for all twelve and 48 lessons. The fee for the first degrees made the student a member of the Order and entitled him to "the secret work, Word, and key." In Masonic fashion, the Order had a Supreme Grand Master (W.T. Wooten), a Supreme Grand Priest; a Supreme Counselor, a Supreme Historian, Supreme Guides, etc. Adams was the Supreme Seer. The Order envisioned a Supreme Temple to be built in Waldron, and annually in the fall, in its guise as the Association of Camp Meetings of Sion Hill, sponsored meetings of the members. Guenon in his "Notice sur les Societes Americains" in La Gnose, said that the camp meeting in 1912 had delegates from 23 states and from Canada, Puerto Rico, India, Brazil and West Africa. Typically, the Order also had a College of Ancient Chaldean Mysticism ($1.00 a week for members of the Order, and $4.00 a week for room and board) and a Magi Health, Success and Happiness Circle, and offered (as a premium for the journal) a free "Psycho-Astro Reading." At some point Adams himself left Waldron, although the journal continued to be published from there, and lived for a time in Beaver Falls, Wisconsin, and then Wayne, Michigan and Mansfield, Ohio. In each place he established a group of followers and in the last his career seems to have come to an end. In August 1918 he was arrested for exhibiting a "lewd" picture to women members of his congregation -- he said the picture was a "work of art which he had planned to hang in the Ark of the Covenant" -- and for having "improper relations" with members of his flock. He was also accused of faking the transformation of water into wine by slipping pills into the cup. The journal featured a "Department of Healing" conducted by Dr. Letta M. Entwhistle of Chicago, that warned against spicy food and constant gum-chewing. She was the author of Inspirational Hymns of the Church of the Brotherhood of Jesus, Ancient Order of Melchisedek, published by the Magi in Waldron in 1909. It also offered poetry in praise of the Supreme Seer, a novelette ("It Is All the Work of the Devil, or A Minister's Conflict with Spiritualism"), and regular offerings on the likes of "Just How to Heal Yourself" ("steady intention to send the Sub-conscious Mind, with ALL your Vital Forces," into the afflicted organs. "The SAME FORCE that generated, that builded your body, atom by atom and cell by cell, will NOW proceed to re-generate and re-build it again."). 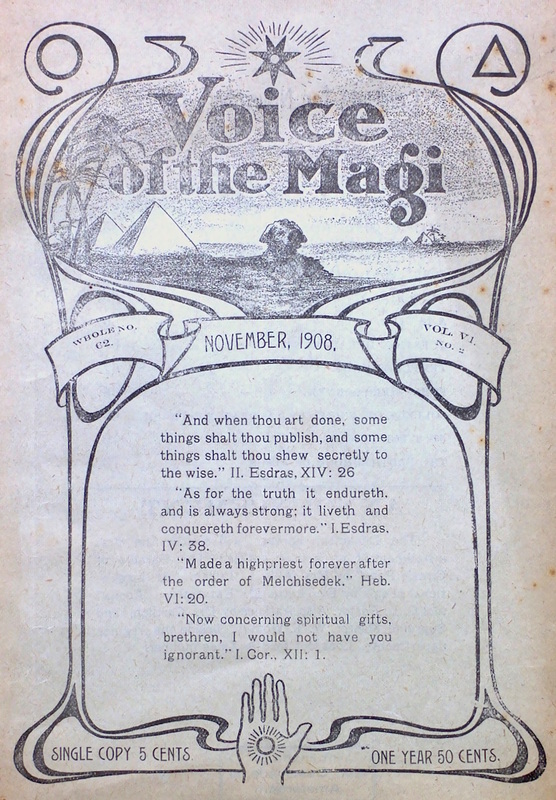 The advertisement for the journal in Self-Culture (Kizhnanattam) in 1911 lists articles by Adams ("the deep trance medium") reprinted as pamphlets, including lectures by Wakeman, Lincoln, Douglass, Beecher, Wendell Phillips, Theodore Tilton, and other reformers, and by Manassah, "an ancient scribe." The journal was noted in H.O. Severance, A Guide to the Current Periodicals and Serials of the United States (1909), and in S.C. Gould's continuing "Resume of Arcane Fraternities" in The Rosicrucian Brotherhood, July 1908. Advertised in Peter Davidson's The Morning Star, 1908 and 1909, and in The Mountain Pine, 1907. The journal carried advertisements for minor figures like Mrs. Fannie E. Paul, of Joplin, Missouri ("Spiritual Medium and Psychometrist: Readings by Mail"), and for a wide variety of minor New Thought and occult journals. The journal was still being published in 1918 when Adams was arrested. International Institute of Social History (6/2, November 1908).